I love the number twelve. I'm not superstitious, but whenever I play any number guessing game, I always pick the number twelve. (Sometimes I even win.) I was really, quite dorkily, excited about this year being 2012. In honor of the year of 12, I am going to do a monthly series on all the reasons 12 is special to me and all the things it represents. There are plenty of weird idiosyncratic things I have concerning the number, but for now, I'll address today's date. The year was 2004. It was the first day of my fourth semester of college. It was a Monday. It was the day Herb and I became "us." 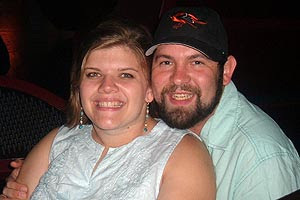 You can read the whole story of January 12, 2004 right here (or check out the entire love story from the beginning, here). Though this is no new content, today, January 12, is an awesome reminder of the last eight years and the blessing that Herb is in my life. He is my best friend, my favorite musician, my supporter and helper, the coolest person in the world, and the love of my life! I am so thankful for January 12. Happy January 12th to you!